14.250.070 Non-Conforming Shoreline Uses and Structures. 1. All legally established uses and structures that do not conform to the requirements of this chapter shall be allowed to continue and remain in the form and location in which they existed prior to the effective date of this chapter. 2. All non-conforming uses authorized through a conditional use permit and non-conforming structures authorized through a variance shall be considered legal non-conforming uses and structures and the requirements of this section shall apply as they apply to pre-existing non-conformities. 3. For non-conforming situations not addressed by this chapter, the “Nonconforming use and development standards” in WAC 173-27-080 shall apply. 1. Uses that were legally established and are non-conforming with regard to the use regulations of this chapter shall not be expanded or intensified, with the exception of non-conforming single-family residential uses that are located landward of the ordinary high water mark. c. The amount of floor area used for water-oriented use is decreased. b. The proposed use will be at least as consistent with the Snohomish Shoreline Master Program and as compatible with the uses in the area as the pre-existing use. 4. If a non-conforming use is changed to a conforming use, the non-conforming use is abandoned and shall not be resumed. c. Time when property is being marketed for sale or rent for the same non-conforming use. 1. Structures that were legally established and are non-conforming with regard to setbacks, height, or buffers described in this program may be maintained and repaired and may be enlarged or expanded; provided, that the enlargement/expansion does not increase the extent of the non‑conformity by further encroaching upon or extending into areas where construction or use would not be allowed for new development or uses. 2. 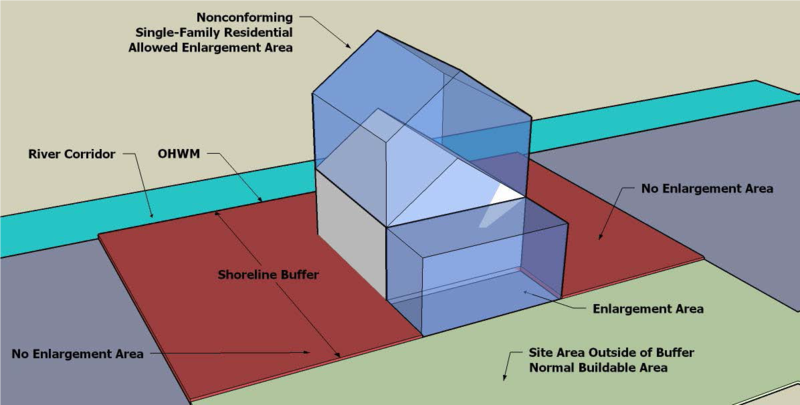 A non-conforming structure which is moved or relocated either elsewhere on the same parcel or to another shoreland parcel shall be brought as closely as practicable into conformance with this program, the Shoreline Management Act, and any applicable sections of Snohomish Municipal Code. 3. If a non-conforming structure is damaged or destroyed, it may be reconstructed to the configurations existing immediately prior to the time the development was damaged or destroyed; provided, that application is made for the permits necessary to restore the development within two (2) years of the date the damage occurred.